While hypoxia may be permanent or intermittent, it is most commonly manifested as a seasonal disturbance, appearing in mid- to late summer after vertical stratification prevents replenishment of deep water DO. The duration, extent and magnitude of seasonal hypoxia has dramatically increased over the past few decades in response to anthropogenic eutrophication (Diaz and Rosenberg 2008) and is now a common and regular feature in marine ecosystems that have strong vertical stratification and low flushing rates. Additionally, climate change may be altering the frequency and intensity of hypoxic conditions in coastal ecosystems (Chan et al. 2008). Hypoxia is an important concern because low dissolved oxygen can have direct and indirect effects on marine communities and natural resources. Hypoxia and anoxia can be lethal to animals when oxygen levels are depleted beyond species physiological tolerances. For sessile organisms who have limited capacity to seek out refuges from hypoxia, direct lethal impacts may be most severe (Diaz and Rosenberg 1995). Mobile species generally act to minimize exposure to low DO through distributional shifts to refuges that have higher DO levels. While these responses minimize direct lethal impacts of low DO, they can induce indirect ecological effects such as reduced feeding rates, enhanced vulnerability to predators and reduced growth rates (Breitburg 1992, Breitburg et al. 1997, Eby and Crowder 2002, Bell et al. 2003, Craig and Crowder 2005, Aumann et al. 2006). In many regions of Puget Sound, low DO is a natural consequence of its deep fjord-like bathymetry, where the water column stratification and slow flushing rates lead to long residence times of deep water that is not in contact with the atmosphere. However, there is some evidence that DO levels were generally higher in the mid 20th century than they are today (Newton et al. 1995). This conclusion is based on a comparison of historical water quality sampling data to contemporary data that used comparable techniques (Figure 1). Changes in the intensity of low DO conditions over a time period of increased human activity suggests a role for anthropogenic activity in dictating hypoxia. Figure 1. Integrated sub-surface water DO vs. day by sampling year in southern Hood Canal. Recent years with very low DO conditions (e.g., 2004, 2006) have no historical precedent over the period of record (1952 -1966). Data and analysis from Hood Canal Dissolved Oxygen Program:http://www.hoodcanal.washington.edu/. Figure produced by and used with permission from M.J. Warner, University of Washington. Low dissolved oxygen is present seasonally in Puget Sound at several locations (Figure 2). Much of the southern one-half of Hood Canal now regularly experiences hypoxic conditions in mid- to late summer. 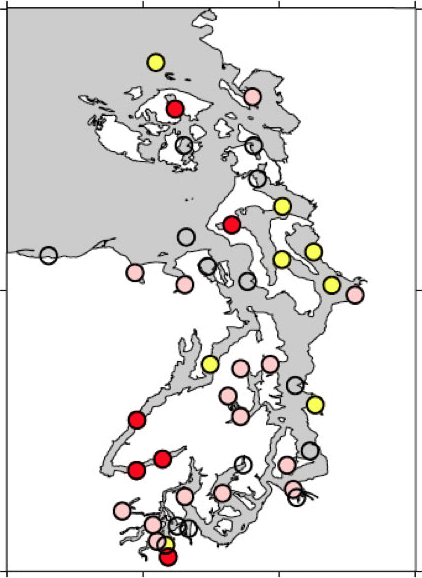 Several regions within the south basin of Puget Sound are also prone to hypoxia (Albertson et al. 2007), especially Budd, Carr and Case Inlet (Albertson et al. 2002). Saratoga passage also is susceptible to low DO (Figure 2)(Albertson et al. 2002). Figure 2. Washington State Department of Ecology water quality monitoring stations showing low (red, < 3 mg /l), stressful (yellow, <5 mg /l) and high (empty circles) DO, 1990-1997. Pink circles indicate stations likely to be to have low DO based on physico-chemical characteristics. Reprinted from Albertson et al. (2002) with permission from Washington Department of Ecology. Since the mid-2000’s, there has been a proliferation of monitoring efforts and web-based distribution of data, especially for Hood Canal. [Editor's note: For updated information about anthropogenic effects on dissolved oxygen in Hood Canal, please view a 2013 review and synthesis prepared by the Washington Department of Ecology and the U.S. Environmental Protection Agency.] These include (1) monitoring via citizens that provides weekly along 6 stations that transverse Hood Canal (2) deploying of remove ocean observing systems (Oceanic Remote Chemical-optical Analyzer, ORCA) that provide high frequency monitoring of water conditions (3) routine monitoring via WA Department of Ecology. These data can be downloaded from http://www.hoodcanal.washington.edu/. The expansion of data collection capacity has revealed the importance of oceanographic processes for determining the spatial patterning and temporal persistence of low DO in Hood Canal (Figure 3). In both Hood Canal and South Puget Sound, research activities are presently underway to develop high resolution models to predict DO levels and their sensitivity to surface flows and oceanographic conditions (Albertson et al. 2007). The below summary emphasizes insights gleaned from the study of Hood Canal, only because of the greater concentration of research activity in this basin. Figure 3. 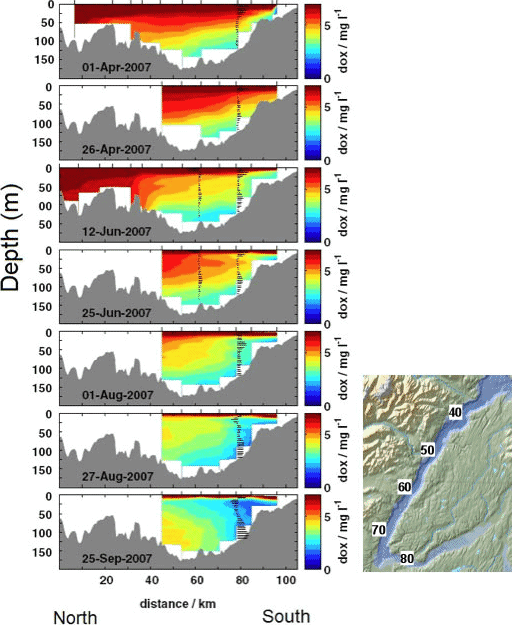 Cross sectional profiles of dissolved oxygen (DO) in Hood Canal, April – September 2007. Hypoxia first emerges at depth in the southern end of Hood Canal, and extends northward along the bottom until mid summer. In mid summer, the horizontal extent of hypoxia constricts southward but expands vertically through late summer / early autumn. Black bars indicate mean water velocities and direction. In the proposed study, the southern impact region spans roughly kilometers 70 – 80, while the north unimpacted region extends from 40 – 50. Inset map shows location of cross section distance markers (kilometers). Figure produced by Mickett and M.J. Warner and used with permission from M.J. Warner, University of Washington.http://www.hoodcanal.washington.edu/observations/ccross.jsp. Hypoxia is a symptom of eutrophication whereby excessive primary production fuels high rates of microbial respiration as sinking organic matter is decomposed in deep waters. 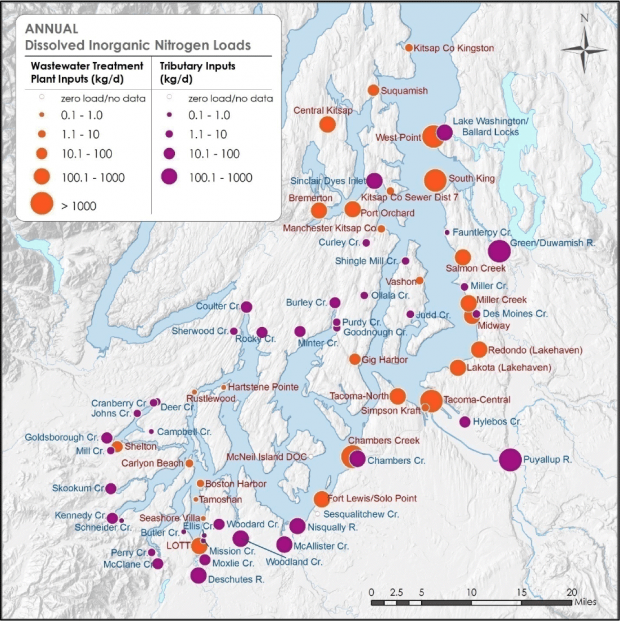 Cultural eutrophication is caused by anthropogenic loading of nutrients that limited phytoplankton growth; in Puget Sound, dissolved inorganic nitrogen (DIN) is the primary limiting nutrient for primary producers (Newton et al. 1998). Thus, human activities that increase DIN loading directly promote hypoxic conditions. DIN enters the Puget Sound through multiple sources: (1) via the surrounding watershed via surface flow, groundwater, wastewater, and shallow septic systems (2) from recycling of nutrient from the sediments into the water column; (3) directly from the atmosphere and (4) from water exchange with the marine environment. Human activity primarily affects watershed-based inputs, although climate change could alter delivery of nitrogen from coastal marine waters. Three primary anthropogenic activities are thought to be important in changing low DO conditions via DIN inputs into Puget Sound. The first is through the conversion of riparian vegetation from a community dominated by firs and cedars to one replaced with red alders (Busse and Gunkel 2001). As alders host symbiotic microorganisms that have the capacity to fix atmospheric nitrogen into a biologically available form, their current abundance may lead to increased nitrogen loading. The second is through shallow shoreline septic systems. A mass balance estimation of DIN loads to Hood Canal revealed that shallow ground water flow from shoreline septic systems contributed less than 5% of the total dissolved inorganic nitrogen to the upper water layer (Paulson et al. 2007). The third is from wastewater treatment plant discharge. In South Puget Sound, wastewater treatment comprises roughly one-half of the watershed-derived DIN loading (Roberts et al. 2008), but this component may be larger if water exchange with the central Basin is considered (Figure 4)(Roberts et al. 2008). At present, there are no published reports or papers that definitively implicate any single source as the most important cause of reduced DO. Figure 4. Annual DIN loads from freshwater surface flows and wastewater treatment plants. Reprinted from Roberts et al. (2008) with permission from Washington Department of Ecology. Hypoxia has been implicated in shifts in benthic infauna and in the pelagic community. Benthic infauna provide the most important source of food for most of the groundfish in Puget Sound so changes is these communities may have important ecological consequences. Long et al. (2007) demonstrated substantial shifts in community structure associated with water column dissolved oxygen levels below 3 mg/L. In general, the overall density of benthic infauna and species richness were reduced as dissolved oxygen decreased. Valero et al (2008) compared population dynamics of geoduck clams in southern and northern reaches of Hood Canal and implicated hypoxia as a significant factor in population declines in the southern region. Parker-Stetter and Horne (2009) described shifts in the distribution of pelagic organisms during a period of pronounced midwater anoxic zone during 2006, suggesting that severe midwater minimum layers can create a predation refuge for zooplankton. However, in the following year midwater oxygen minimum layers did not appear to affect the vertical distribution of fish and invertebrates, although it did appear to impact the rate of diel migration (Parker-Stetter et al. 2009). Palsson et al. (2008) described substantial vertical distributional shifts of rocky-reef associated fish species in response to the low dissolved oxygen event, but also noted that responses varied by species. Essington and Paulsen (2010) used a comparative approach to ask whether there was evidence of hypoxia on densities of demersal fish and macroinvertebrates in southern Hood Canal. They found strong evidence supporting the hypothesis that sessile macroinvertebrate densities are strongly reduced by hypoxia: the five main species sampled were generally reduced in abundance by ca. 90% compared to what would be expected based from the reference sites. In contrast, there was little evidence for persistent density reductions in mobile fauna. However, mobile macroinvertebrates and fishes exhibited significant density reductions in southern Hood Canal during late summer when hypoxia was present, presumably due to behavioral distributional responses that displaced individuals from southern Hood Canal. The large reduction in demersal species' densities suggests substantial effects of hypoxia in Hood Canal even at oxygen levels that were marginally hypoxic (2 mg / l). They conclude that understanding the full ecological consequence of hypoxia will require a greater knowledge on the spatial extent of distributional shifts and their effects on competitive and predator–prey interactions. Identifying the ultimate causes of hypoxia and policy responses that might mitigate them remains a high priority. Because of high interannual variability, it is not possible to discern whether the intensity or spatial extent of hypoxia has been growing over recent years. Moreover, the long-term effects of regular exposure to seasonal hypoxia on communities and food webs has not yet been published. Valuable species such asgeoduck clams and Dungeness crabs may be adversely affected by hypoxic conditions, though it is not yet possible to definitively quantify the contribution of hypoxia to putative population declines in hypoxia-impacted regions. Aumann, C. A., L. A. Eby, and W. F. Fagan. 2006. How transient patches affect population dynamics: The case of hypoxia and blue crabs. Ecological Monographs 76:415-438. Bell, G. W., D. B. Eggleston, and T. G. Wolcott. 2003. Behavioral responses of free-ranging blue crabs to episodic hypoxia. II. Feeding. Marine Ecology-Progress Series 259:227-235. Breitburg, D. 1992. Episodic hypoxia in Chesapeake Bay: Interacting effects of recruitment, behavior, and physical disturbance. Ecological Monographs 62:525-546. Breitburg, D. L., T. Loher, C. A. Pacey, and A. Gerstein. 1997. Varying effects of low dissolved oxygen on trophic interactions in an estuarine food web. Ecological Monographs 67:489-507. Busse, L. B. and G. Gunkel. 2001. Riparian alder fens - Source or sink for nutrients and dissolved organic carbon?:1. Effects of water level fluctuations. Limnologica 31:307-315. Chan, F., J. A. Barth, J. Lubchenco, A. Kirinich, H. Weeks, W. T. Peterson, and B. A. Menge. 2008. Emergence of anoxia in the California current large marine ecosystem. Science 319:920. Craig, J. K. and L. B. Crowder. 2005. Hypoxia-induced habitat shifts and energetic consequences in Atlantic croaker and brown shrimp on the Gulf of Mexico shelf. Marine Ecology-Progress Series 294:79-94. Diaz, R. J. 2001. Overview of hypoxia around the world. Journal of Environmental Quality 30:275-281. Diaz, R. J. and R. Rosenberg. 1995. Marine benthic hypoxia: a review of its ecological effects and the behavioural responses of benthic macrofauna. : Oceangraphy and Marine Biology : an Annual Review 33:245-303. Eby, L. A. and L. B. Crowder. 2002. Hypoxia-based habitat compression in the Neuse River Estuary: context-dependent shifts in behavioral avoidance thresholds. Canadian Journal Of Fisheries And Aquatic Sciences 59:952-965. Long, E. R., M. E. Dutch, S. Aasen, K. I. Welch, V. A. Partridge, and D. A. Shull. 2007. Relationships between the composition of the benthos and sediment and water quality parameters in Hood Canal: Task IV Hood Canal Dissolved Oxygen Program. WA Department of Ecology, Olympia, WA. Newton, J. A., M. Edie, and J. Summers. 1998. Primary productivity in Budd Inlet during 1997: Seasonal patterns of variation and controlling factors.in Puget Sound Research 1998. Newton, J. A., A. L. Thomson, L. B. Eisner, G. A. Hannach, and S. L. Albertson. 1995. 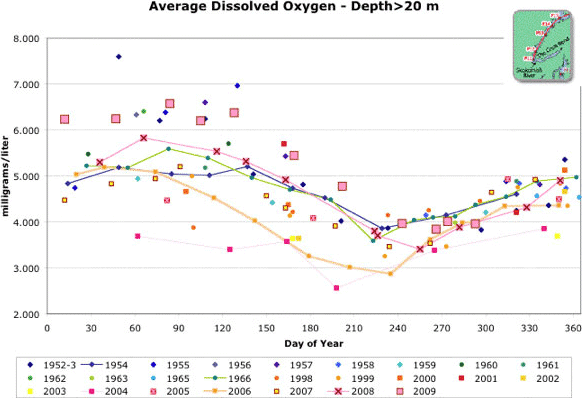 Dissolved oxygen concentrations in Hood Canal: are conditions different than forty years ago?in Puget Sound Research '95. Parker-Stetter, J. L. and J. K. Horne. 2009. Nekton distribution and midwater hypoxia: a seasonal, diel prey refuge? Estuaries and Coasts 81:13-18. Parker-Stetter, S. L., J. K. Horne, and M. M. Langness. 2009. The influence of midwater hypoxia on nekton vertical migration. ICES Journal of Marine Science 66:1296-1302. Valero, J. L., B. Lee, D. Armstrong, L. Orensanz, A. Parma, R. Hilborn, B. Sizemore, and T. Palzer. 2008. Population dynamics and historic trends of geoduck clams under episodic low dissolve oxygen conditions in Hood Canal. Journal Of Shellfish Research 27:462-463.